Aloe pillansii is named after Neville S. Pillans, a well-known Cape botasnist who first collected Aloe pillansii. Aloe pillansi has been placed on the endangered specie list due to ove-grazing and collecting. Aloe pillansii South African national tree number is 30. Aloe pillansii is not easily mistake for Aloe dichotoma. Aloe pillansii can be easily distinguished from a Quiver Tree by looking at the inflorescence that is borne almost horizontally from the rosette. Aloe pillansii is also far more robust than Aloe dichotoma. Common Names: Giant Quiver Tree, Reusekokerboom. Status: Endangered due to overgrazing and collection. 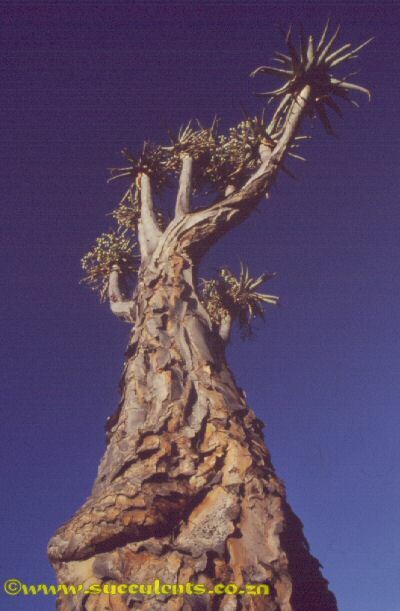 Distribution: Aloe pillansii occurs from Cornell's Kop in the Richtersveld northwards to Brandberg in Namibia. The yellowish-grey trunk splits dichotomously into erect branches, that never spread and terminate in large rosettes of thick fleshy greyish-green leaves (600mm in length). The leaves are falcately deflexed and have whitish-cartilaginous edges with cartilaginous teeth. Inflorescence is branched and downward facing and flowers are yellow in colour and slightly swollen in the middle. Flowering Time: Aloe pillansii flowers in October. Notes: Aloe pillansii is and easy plant to cultivate. A well drained soil is required, with careful watering. Full sun is required and frost protection in winter is required. (USDA 8 - 10). Picture: Aloe pillansii in habitat in the Richtersveld.